Considerations of light theory in other sections of this site show that physics taking light as waves or as particles fail to satisfactorily explain all of its various behaviours, and neither does the currently popular theory that light is somehow both. But physics has generally not yet tried taking light as being simply a signal, in the way that it commonly is taken in signal theory. So it may be of some interest to now examine the possible consequences for physics of treating light as being just a signal, or communication of information, starting from some consideration of the basics of signal-response theory. The basics of signal-response theory can be taken as being that any body can be a signal, relative to some observer body that can respond to it. And that any body can be an observer, relative to some signal body to which it can respond. Response can be to any property or properties of a signal that can be taken as carrying data or information, and hence signal responses may or may not reflect the basic nature of the signal itself but might just eg reflect anything that had previously happened to the signal. A signal-response physics like William Gilbert's is necessarily an information physics, while no kind of push-physics can really be. Data or information is a possible derivative of signals, and the continued existence of a bit of information need not require the continued existence of the signals that it derived from. The simplest signal is exist/non-exist (on/off or 0/1) and even that can give more complex data or information in its eg temporal and/or spatial arrangement. Signal-response theory generally does not assume any specific mathematics, eg signal strength need not always decrease as the square of the distance from its source and a response strength might be fixed over some wide range of signal strengths or might vary with signal strength to some non-simple law. Of course particular pieces or forms of signal-response theory can assume some specific mathematics. In nature different bodies can respond in regular ways to different natural signals, but modern technology can link almost any response however complex to almost any signal however simple - basically as the human brain can. And in many cases direct signal detection may not be possible and can only be inferred from observed response reactions though signal and response can appear quite unlike, though not necessarily excluding, action and reaction. Hence some or all existent objects can emit signals that indicate their colour, magnetism, mass, motion or other properties of the signal emitting object. Emitted signals indicate or reflect properties of their emitters, so that responses of other objects to received signals are responses to properties of signal emitters and are caused by the signal emission to the extent that the signal is not modified in transmission or by signal reception. In signal theory signals are basically anything to which some signal detector can produce some response, so that there are two separate related phenomena being signal and response. If light is taken as being a signal, then different physical systems might be expected to show some different responses to light. This appears to be the case with at least some light-related phenomena like reflection and refraction. It has even been shown that punching holes in thin plates can increase OR decrease the amount of light that appears to penetrate a plate, see Physics World light And while in nature there are many cases of bodies affected by light as a source of heat or energy, there are many cases in nature and in technology of bodies responding to light as a signal. Of course Newton concluded that colour was a property of light itself and was not just a property of illuminated objects modifying light, which he claimed 'to have proven definitely with a crucial experiment'. But unlike William Gilbert earlier, Newton failed to publish the exact details of his experiment and so did not help with correct replication by other scientists. And also later Newton allowed that light itself might respond to some signals from objects or their atoms as to gravitational signals. In any physics that does not take light as being a signal, light impacting different physical systems may be taken as being different behaviours of light itself. This can lead to taking reflection, refraction, diffraction, photoelectric emission, Compton emission etcetera as being light behaviours. And some of these apparent light behaviours can be taken as evidence for light itself being an ether wave, a quantal particle, or either or both. And a quantal particle might be a simple Cartesian push particle or a Gilbert-Newton attraction physics particle that can respond to force signals like gravity or magnetism. But in a physics that takes light as being a signal, light impacting different physical systems can be taken as evoking different detector responses. This leads to taking reflection, refraction, diffraction, photoelectric emission, Compton emission etcetera as being responses to light signals. And some of these being responses can be taken as giving no evidence for light itself being of any specific nature if the nature of responses is not fully determined by the basic nature of the signals involved. Generally in signal theory the nature of responses is not fully determined by the nature of signals, but reflects only some one property or few properties of a signal. Hence some detectors can give digital quantal responses to some continuous signals, or give analog continuous response to digital signals. See eg Digital to Analog Converter or Analog to Digital Converter - though these sources may not be the best. And the different magnetic responses (as attraction, orientation and magnetization) to the same signal can operate at very different ranges, so that apparent 'signal range' can clearly be less a property of the signal than an indicator of response sensitivities. 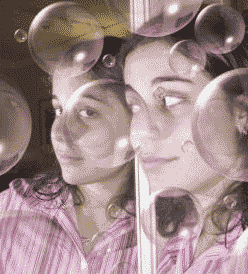 - A repulsion explanation of light reflection also looks workable. So clearly Newton in his Opticks proved how action-at-distance physics allows objects to appear to collide without any actual collision. And several possible theories of light reflection, including also some absorb-photon/emit-different-photon theories and others, can give the same reflection angles - and events at the atomic level not being actually visible means that experiments cannot readily decide between a range of theories. But though classic collision and some different reflection alternatives might all have compatible macroscopic maths, they should differ in their microscopic maths where also the possibly digital nature of force signals might also need to be accommodated. 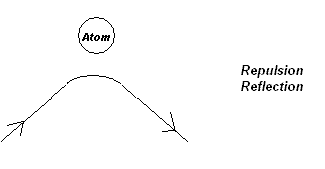 While an actual collision event must occur at the time of collision, a proximity-repulsion event would start somewhat before that time and an attraction-slingshot event would start somewhat after that time and such small differences might show in a suitable large range of collider results. Some of these issues may also apply to light diffraction a seemingly simple phenomenon, taken by some as supporting maybe a wave theory or taken by some as supporting maybe a probability theory, requires the dominance of solid edges and their possible undetermined proximity forces. But photons (and elementary particles generally) do not have fully individual identification characteristics like fingerprints that might help with detailed experiment. Of course many non-light experiments involve similar interpretation problems generally with some unsubstantiated assumption being widely favoured. Newton did see most then known light behaviours as evidence more of it being a form of attraction matter than being just waves of something and requiring all space to be filled with a novel wavable no-push medium (somehow also additional to Einstein's supposed no-push spacetime-continuum also filling all space, which also perhaps fits very uneasily with the push-physics it is generally set in). 1. The Compton Effect involves light deflecting electrons in proportion to light energy, seemingly in an analog manner or to multiple photons with no threshold-frequency. The Compton Effect may indicate atoms or sub-atomic particles being able to add-up consecutive digital signals over time until some target figure is reached to trigger response - or that some time-spread signal property of a continuous signal triggers response. The Photoelectric Effect may indicate atoms or sub-atomic particles responding to each single case of a digital signal - or that some short-time signal property of a continuous signal triggers response. In both of these light phenomena a signal theory can allow of light showing either digital or analog effects without requiring the current physics duality contradiction of it being both itself. Some other light behaviours that are commonly taken as being responses to light, rather than properties of light, include light slowing and induced transparency - and these cases involve variable response. Two-slit diffraction light interference is another light phenomenum for which a variety of strange explanations are currently claimed by many physicists. But in a two-slit diffraction experiment using single photons or particles, if you consider each photon or particle individually, then they seem to act 'sensibly' by each passing through one of the diffraction slits simply. However otherwise if you do not consider each photon or particle individually, then they all seem to act 'strangely' by each appearing to pass through both of the diffraction slits probabilistically or 'impossibly'. This seems to exclude any kind of simple contact-push physics mechanism controlling which passes through which slit, leaving it that the most likely actual classical physics explanation seemingly must be some version of some action-at-distance physics signal-response mechanism. But for most physicists then who wrongly dismissed classic action-at-distance physics it seemed that this required the acceptance of some illogical physics. Of course a logical and scientific classical action-at-distance physics explanation might better involve some kinds of force-signal emitted by slit-edges to which light particles somehow respond, and/or some kinds of force-signal emitted by light particles to which slit-edges somehow respond ? A signal view of light would have some significant consequences for physics. One thing it would throw doubt on is Einstein's conclusion that photoelectric emission is evidence of light being actually quantal, but it could also cast doubt on other claimed evidence for light being also actually a wave. Waves and particles have substantially different mathematics that do not seem to be simple transforms of each other, so it seems that wave and particle theories cannot be compatible image theories of each other. But in fact a signal view of light could perhaps allow of both quantal and wave type responses without any contradictory 'duality' requirement of light itself. Digital signals can give digital or analog wave responses, and analog wave signals can give analog wave or digital responses. Contradictory appearances do not have to indicate contradictory realities. The observed speed of sound in a given direction in moving air, like the speed of a bullet, reflects both the velocity of sound in air and the wind velocity in the given direction - also the observed speed of sound reflects any source and/or observer relative motion. For moving waves or regular beams of particles or signals from some source, there will be some 'relative velocity effect' to some observer if some measure of the distance between the source and that observer is changing. To both Doppler and Newton the applicable distance is the fixed straight-line distance, but to Einstein it is some variable spacecurve distance. But the observed speed of light is claimed not to show any such effect, and to be invariably constant. This is the basis for the main claims of Big Bang expanding-universe cosmology, which takes observed Hubble light redshifts being greater for more distant galaxies as being caused by only a Doppler relative-velocity frequency Effect. But possible alternative explanations include both large-distance slight energy loss (Tired Light), possibly due to large-distance slight gravity slowing. Hubble favoured the latter being additional to a Doppler effect. 1. physical bodies either do or do not carry some natural information before an observer observes ? 2. signals either do or do not carry some natural information before they are detected ? 3. physical bodies either do or do not carry some natural information before they emit signals ? 4. signals either do or do not carry natural information reflecting the full nature of their source ? These and other related issues have not always been properly addressed by physics theories to date. A signal physics may seem better able to handle this, though no doubt non-signal image theories of a signal theory would be compatible also. It is of course possible that forces like magnetism, electricity and gravity may also work by signal response as proposed first by William Gilbert, and so allow of a signal physics 'theory of everything'. Responses to signals can involve issues like signal thresholds, response times, signal noise, excitation states, conditional response and signal summation. Depending on the particular signal response parameters involved, signal response systems may also be capable of looping or of hanging. And for some signal response systems a numbers of factors may vary the probability of some signal giving some response. Avoiding the use of signal theory, current physics struggles poorly to explain much, such as exactly what is light slowed and shrunk !? Such signal theory physics goes right back to 1600 when William Gilbert explained magnetism as response to emitted signals he termed 'effluvia', and took electricity and gravity as working similarly, and this signal physics was developed further by Isaac Newton in his using 'attraction theory' as one explanation option in his blackbox theory of gravitation. Of course unintentional natural signals might include direct emissions from objects or events, as masses emitting gravitons or causing space-curvatures, or be indirect signals as from some external interaction with the object or event, with experimental interactions being intentional replicatable attempts to elicit natural signals. A signal theory physics might still have some usefulness for gravity, for light and maybe more. Signal theory allows that anything that can convey information can be a signal. Hence all human senses are concerned with signal detection, as in hearing, sight and touch. From this it is clear that some natural signals might take the form of waves in a medium, and others might take the form of particle objects. Any single object's speed or velocity is simply the rate of change of its position with time in a specified direction. But waves in a medium, and sets of multiple moving objects, can have a group velocity and a phase velocity so that talk of their speed can be ambiguous. Claims that a single object is somehow a wave can involve ambiguous assumptions regarding its speed. There can also be issues with wave mathematics assuming a medium to be continuous rather than quantal or particulate. A light beam may seem to be likely either a continuous medium-wave (if space has any medium) or a set of multiple-object photons, and maybe less likely a set of single-object photons. As zero can rarely be actually distinguished from very small, claims of light being 'massless' can maybe only be proved to be of it not having a big mass. But when discussing medium-wave or multiple-object motion, 'speed' should always be clearly specified as being either the group velocity or the phase velocity. On differing interpretations of eg 'double-slit' light experiments, see - quantum light theory. A. Some normal multiple-particle motion properties. 1. Particle motion is not resisted by a vacuum but is by higher-resistance mediums, and the velocity of motion of particles through a low-resistance medium like a vacuum is significantly affected by particle forces such as gravity. 2. Particles can be accelerated to some velocity as by a force like gravity, and in a low-resistance medium like a vacuum will tend to maintain their velocity. And multiple-particle a stream or beam of emitted particles being some regular stream of single particles, or may be pulsed with each pulse being some set of multiple particles. 3. For both multiple-particle source and multiple-particle detector within a low-resistance medium like a vacuum, their motion relative to each other or to the low-resistance medium changes apparent detected velocities or frequencies for the detector but does not change absolute as-emitted velocities or frequencies in the low-resistance medium. 4. In a low-resistance medium like a vacuum, no medium motion will cause multiple-particles motion in it to suffer any velocity or frequency change. B. Some normal wave properties, as of sound waves. 1. Sound waves cannot propagate through a vacuum, and in any fixed medium the propagation of sound waves through it is not significantly affected by a particle force such as gravity. And wave motion may involve a single wave of some frequency, or may involve multiple waves of differing frequencies that will make it pulsed. 2. In any fixed medium, sound waves will propagate through it at some specific fixed velocity that is often higher for higher-resistance mediums - so the speed of sound in air is 343 m/s, in water is 1,433 m/s and in denser materials can have higher values. 3. For both sound source and sound detector within the same fixed medium, their motion relative to each other or to the medium changes apparent received sound frequency for the detector but does not change the absolute as-emitted sound frequency in the medium nor the apparent sound velocity for the detector. 4. In a medium moving at some velocity, sound will approximately propagate through it at a velocity that is the sum of its specific fixed velocity for that medium and the medium velocity - without change of absolute as-emitted sound frequency in the medium. While some of the above wave properties and (multiple-)particle properties are logically mutually exclusive, many claim that some or all physical things (notably including light) possess some or all of both sets of properties at the same time. While duality theory generally takes the extreme position on this, some prefer the position of things changing properties between particle and wave properties in different experiment circumstances only. James Clerk Maxwell's equations for time-oscillating electric and magnetic forces are wave equations, but this really only supports time-oscillation like timed particle emission being wavelike in having a wavelike maths. It is poor support for any general wave physics theory It is certainly no real support for light being any wave, when nothing can be identified that it could be a wave of. And there seems little basis for claims that 'light is electromagnetic', when light is not affected by any steady electric or magnetic field (though electric-charged matter can produce light and show response to light). And as at least most medium-waves cannot transmit through a vacuum or through space, it is perhaps doubtful that there is any real evidence for electrical or gravitational force transmission being based on waves rather than being some as yet undetermined emission signals. And while most modern physics theory may have no natural place for time, signal theory physics in fundamentally involving response to signals fundamentally involves time as a consequence. What basically distinguishes a response event from a signal event is simply time, with signals being causes and responses being subsequent effects. If an attraction response cannot precede an attraction signal, then the universe is not time reversible and has one-direction time inbuilt. Many other physics theories by default predict a time reversibility that is quite contrary to many confirmed experiments.